Three legs are better than two! Get your playground hopping with our special needs swingset structures. Bring this sturdy, galvanized steel tripod swingset to your playground or play area, and it’ll handle your most demanding users. 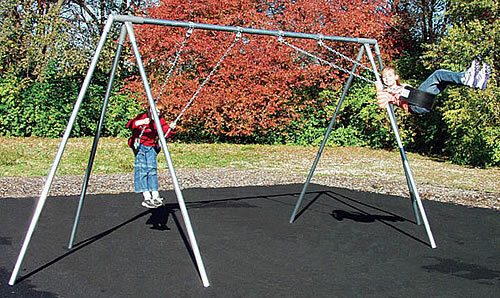 The Tripod Swingset is available in heights of 8 feet, 10 feet, and 12 feet. You can select between models with 8 seats, 6 seats, 4 seats, or 2 seats (the picture shown above has 2 seats). Included: All Tripod Swingsets include come with self lubricating swing hangers,galvanized steel pipes, 4/0 galvanized welded chain, and cut-proof seats.You can substitute ADA seats, chains, and hangers for an additional change. Interested in the Primary Tripod Swingsets?